The idea of différance posits that the differences between language and phenomena are not fixed and binary, but rather mutable, shifting, and entangled…an idea that insists upon the principle of difficulty and provision. While this idea resides most often in post-structuralist philosophy and linguistics, it does a good job of describing the curious environment in Jeff Vandermeer’s latest novel, Annihilation. Four explorers are sent to Area X–a place where little is as it appears and the delineation between explorer and explored is perhaps more porous that expected. 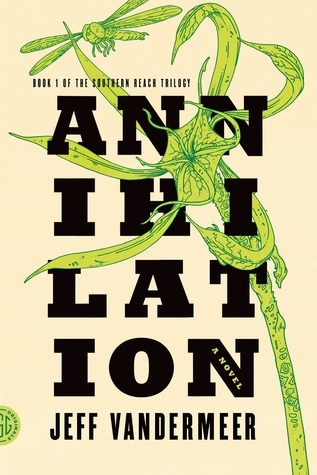 Annihilation returns to some of Vandermeer’s obsessions: engaged and threatening environments, fungal blossoms, and narrators who are as lost as they are smart. Yet the baroque story-telling of Vandermeer’s earlier book, City of Saints and Madmen, gives way to a much more focused story wherein Vandermeer’s best qualities are on display. Area X may be uncontrolled, but Vandermeer’s prose certainly is not. A biologist, our unnamed narrator, begins the story already in Area X with three other women: a surveyor, an anthropologist, and a psychologist. Their assignment from a mysterious organization called Southern Reach is to map the area and record their observations. This sounds fairly direct, but when we learn that each has had to undergo hypnosis just to enter the zone, that they are not to share names, and that they are the twelfth expedition (the eleventh having unexplainably returned with no memory and then quickly dying), the area’s impact is immediately a visceral presence in much the same way that the Zones are in Boris and Arkady Strugatsky’s Roadside Picnic, AKA Stalker (which this reviewer asserts haunts much of Vandermeer’s novel). Discoveries are made, people disappear, creatures emerge, but our narrator’s slow unveiling of her past and own personal transformation is what drives this very strange short novel (part of a trilogy—all to be published in well-designed paperbacks this year). Slipping between science fiction and fantasy, Annihilation is a terrific novel for readers of both, for readers who enjoy protagonist-against-nature, and for readers who enjoy character-driven narratives. While our narrator keeps assuring us of her objectivity—suspect, of course—we nonetheless trust her honesty, grateful for her detailed description of this place both enticing and repellent.